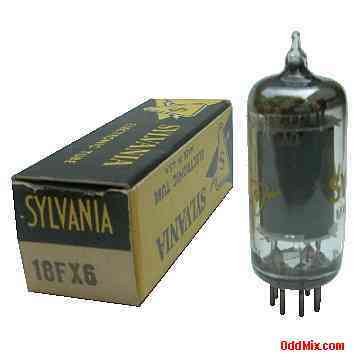 This is an original, discontinued Sylvania 18FX6 Electronic Tube. These miniature, lightweight, portable, compact, tubes were used as mixer oscillators converter in ac/dc and battery operated receivers. An antique, pentagrid converter vacuum tube. Useful for antique radio restoration projects or to set up a private vacuum tube museum. It is a NOS tube - new old stock, unused, boxed, excellent condition.